Bonus points if you can tell me about the artist and what the business used to be back in the '80s and '90s. Sorry the picture quality isn't great here. The lighting was weird with all the funky weather. I know where that is at! I'll pretend like I can go get it. 2 weeks and counting! Funny, I was going to go there next...now I guess I really am, if it stops raining and no one beats me to it! TAG! 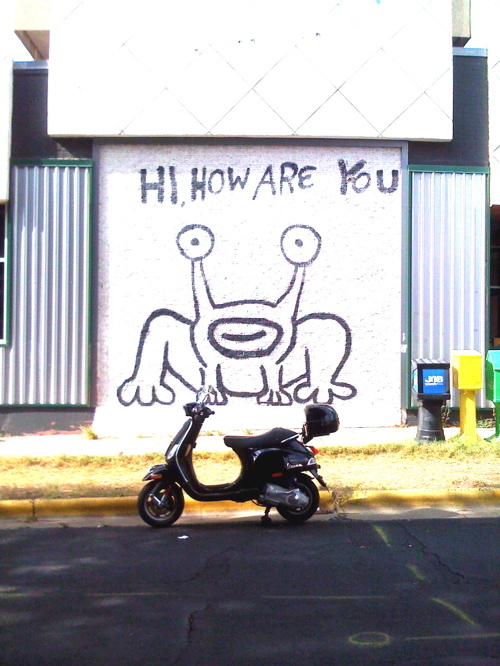 Daniel Johnston painted a MURAL of the "Hi How Are You" frog on the side of the SOUND EXCHANGE music store on Guadalupe Blvd in Austin Texas, at 21st street. (I Googled this, I knew where and who just not the old "what building".) Fortunately, I don't live too far, so I was able to dart out between rain showers. 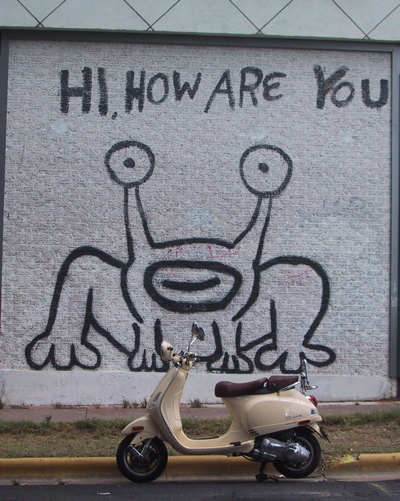 Can't wait until you've had your MSF class and return from Hungary! 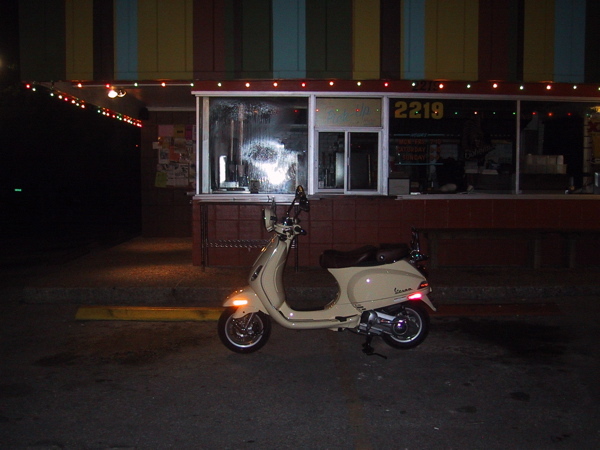 I really like that color on your scoot. 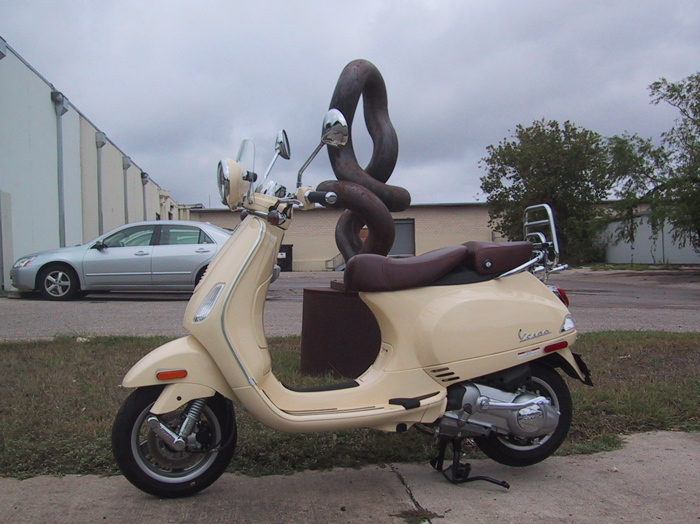 Vespa of Austin had a BV500 in that color but it didn't look right with the aggressive back and all the flat black plastic parts but yours looks great. Thanks! I really like the color, too. Especially with the brown leather seat. (Steve's looks good with the brown leather seat, as well). can you give another hint? 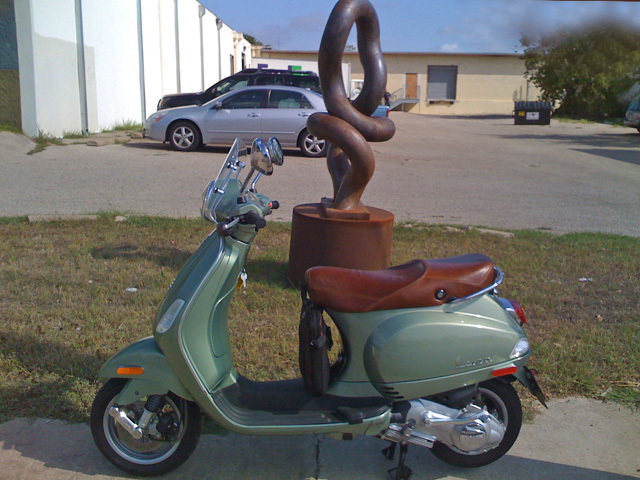 It's a sculpture in front of a gallery which specializes in printmaking...near a new Capital Metrorail Station...on a major road less than 2.25 miles from the last tag. TAG! Not sure of the address, but it's roughly around the 3000 block of East MLK, just West of the railroad tracks. Let me know if you need a clue about this location. will defnintely need a clue. Often voted as having the best desserts. Pretty sure I know it, but cannot get there until tomorrow. Someone beat me to it!!! C'mon!!! Come on Mark! We need to get some more MVers to play along if they can. I know you missed out on the West 15th Street one, so maybe you can nab this one? I wish I could. I'm in my car today to get an estimate on a fender bender repair. It's a bummer but both my car and my scooter need to go into the shop, car first and then scooter. 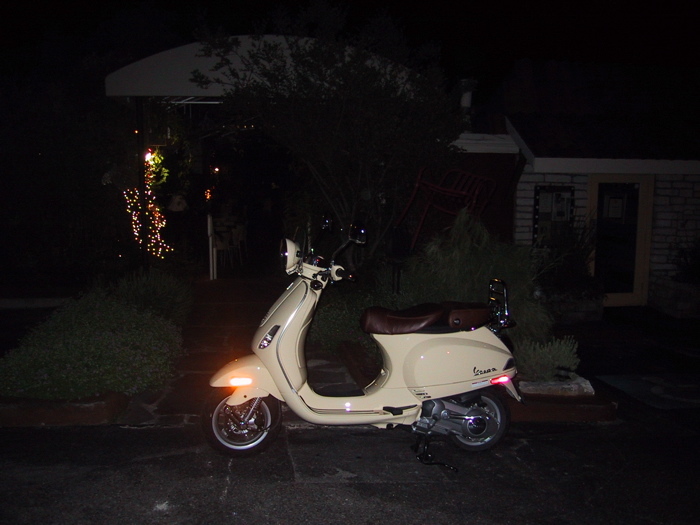 If I can get the car in on Monday I'll be scooting all next week so maybe I can play. I do have a hard to find pix already taken and ready to post when I tag one. I'm enjoying seeing all the pix you guys are taking. We should organize a ride so y'all can take me to see the cool things around in my own city. Sorry to hear about the fender bender. Absolutely . . . we will try to get everyone together. I'll be out of town (out of the country, actually) all of next week, so the others here will need to keep the tag going. Once I'm back, I thought I'd try to organize a meet, somewhere central to everyone who's participating in this thread, so we can all get to know each other a little. 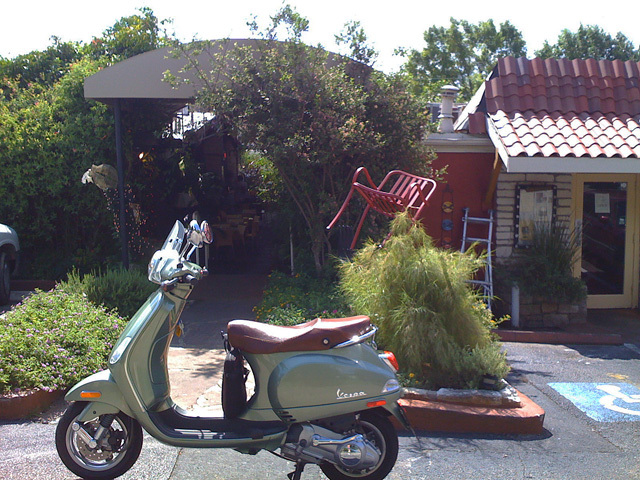 Clue #2: "We're saving a chair for you"
Go Chub Go! I'm trying to be good today and workout before work rather than dash "up" there and get the photo... I don't want to be a TAG hog, either. I can't believe two Austinites are going to be out of the country at about the same time. I'm sooo jealous! Don't be jealous I won't be going to Budapest until the end of Sept... Good job on the exercise. I have been running every morning around the hike and bike trail and it is killing me! I figured all those people running around the lake were skinny so I should start running so I can be skinny. Not working so far. My friends in Budapest are moving to Ireland, so that gives me something to look forward to... I hope you have a great time. Just DON'T try to break one banana off a bunch at the central market. A vendor about whacked my supervisor upside the head for doing this and ruined her whole trip. Oooh I do that all the time at HEB. Thanks for giving me that heads up. I guess I'll avoid the banana's all together when I am there. Yeah, crazy, huh? I think if you went into a grocery store there, it'd be cool. But the central market is worth a visit and there it's individual vendors. I couldn't take it any more!!! 6a.m.? Wow now this game is getting serious. Good lord, when I'm in my cage I drive by it every morning. 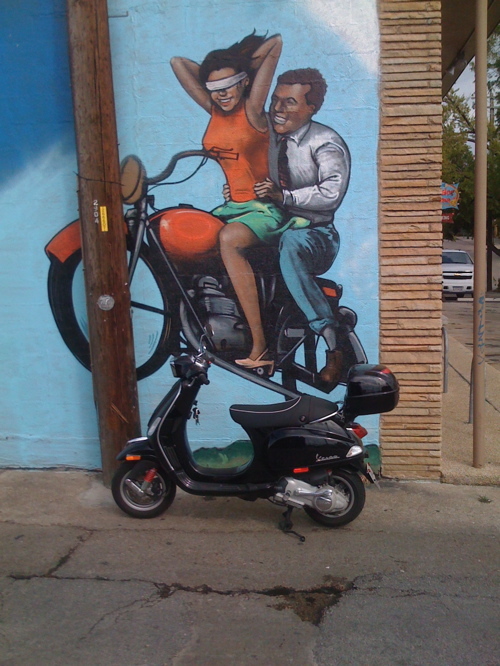 On my scoot I go a different way to work. Guess it doesn't pay to drive when you are asleep. You miss a lot. Thanks for putting it up my way Steve, sorry I missed it. yeah, I am dedicated to the game, but you won't be seeing any 6am's from me! lol. I know where this is, but I am laid out flat by alergies right now. Darn. So sorry about the allergies! I'm about to be down from ragweed in a few weeks, so I feel your pain. Just a reminder that I'm leaving town for the next week (back on the 30th). Y'all will need to keep the tags going while I'm gone. I'll get caught up with your fun when I return. Have a good trip Steve! We'll see your tags when you get back. I know where it's at! Someone go get it for me! Is there anyone left out there to get it?? ?